That statement — and sentiment — can be equally applied to Creed II (**1/2 out of four), which, like its predecessor, is enjoyable in fits and starts. The best aspects of the first Creed remain the selling points here — namely, the performances by Michael B. Jordan and Sylvester Stallone. Jordan again excels as Adonis Creed, the son of the legendary boxer Apollo Creed and the current heavyweight champion of the world. And while Stallone, whose two Oscar nominations as an actor were for the original Rocky and the original Creed, isn’t given quite as much to do here, he’s still wonderful in the role. Garrulous of mind and generous of heart, Rocky Balboa remains a rich and complex character, and even his demotion from series focus to supporting player has done nothing to quell his all-embracing humanity. Given the fact that the Rocky/Creed franchise has always feasted on the past, the hook this time isn’t exactly unexpected. Ivan Drago (Dolph Lundgren), the Russian boxer who killed Apollo Creed in the ring before being vanquished by Rocky (see 1985’s Rocky IV), now has a son, Viktor (played by boxer Florian “Big Nasty” Munteanu), who’s carrying on his father’s personal vendetta against Rocky and the Creeds. It’s arranged for Adonis and Viktor to square off, with more than just a championship on the line. For both men, it’s a chance to right perceived wrongs from the past while serving up a side dish of revenge. Adonis is torn between following this path or taking the sage advice of his wife Bianca (Tessa Thompson) and mother Mary Anne (Phylicia Rashad). Viktor just grunts a lot in preparation. As for Rocky, who was ringside when Apollo was killed, he has to decide whether or not to similarly coach Adonis in what might prove to be a death match. It’s irresistible material — or at least it would be if the film ever bothered to offer any narrative surprises or unexpected character beats. Instead, it’s once again played at a safe level, as director Steven Caple Jr. (replacing Creed writer-director Ryan Coogler, who moved on to Black Panther) and the quartet of writers (including Stallone) are fearful of damaging this enduring tentpole. When the most emotional instance in the entire picture occurs as Bill Conti’s magnificent signature score from the first Rocky finally finds its way onto the soundtrack, it’s clear we’re responding in a Pavlovian manner to the music rather than the moment. That’s not too say Caple (helming only his second feature) botches the assignment, as there’s enough to enjoy to earn the film a modest recommendation. Even given their predictability, the fight sequences are effectively staged, and the training montages are also handled well. Still, what’s most interesting about Creed II is its correlation with Rocky IV. That earlier film is utterly daft, but it’s also a perfect snapshot of the Reagan ‘80s, as audiences cheered as all-American Rocky took down the dreaded Commies — the film even ended with the Russkies themselves (both the commoners and the politicians) cheering for Rocky! 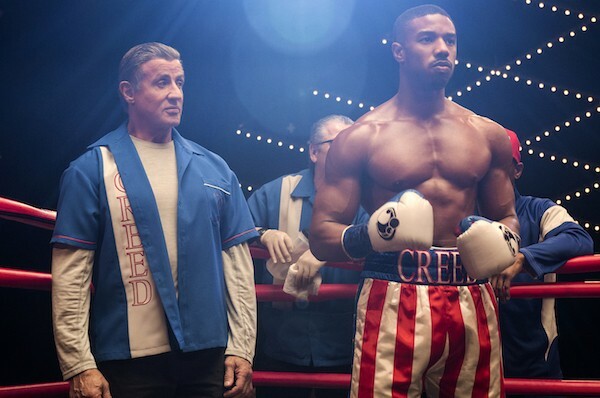 Creed II offers comparable scenes, but the sociopolitical sheen has worn off and perhaps even switched sides. After all, in the current arena, there are many who would relish the sight of a white Russian beating up a black American — a ghastly realization that would have been unimaginable in any other era.